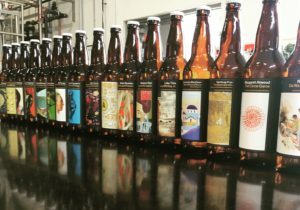 Henderson Brewing company is a locally owned, award winning, neighbourhood brewery in downtown Toronto. Founded in 2014, Henderson is all about celebrating the stories and culture of the city through the beers they brew. The company was founded by friends sharing a lifelong love of beer, a commitment to quality, fun and experimentation. These traits extend to their product labels. While the brewery has only been open for a year, in their early days, Tony Halmos, Henderson’s Art Director and Brand Consultant, recalls the challenge of very briefly working with a labelling competitor for their cans and bottles. “It didn’t go well,” Halmos said, noting one of the worst customer service experiences he’s ever had. 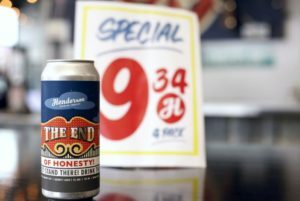 From there, discussions were sparked about the benefits of labelling Henderson’s beer cans with pressure-sensitive labels. When it came down to choosing between labeling their cans or applying a plastic sleeve, the team opted for the digital labels to mimic both the trend in the United States where Halmos says, “They’re not afraid to show a lot of can,” and to further extend the stainless look of their brewery onto the product itself. beer cans and its consumers. 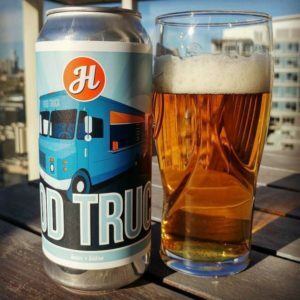 “The perception has always been, historically, particularly in Ontario, that cans are cheap and cheap beer comes in cans. So, if you drink beer from cans, you’re a cheap person.” The team at Henderson didn’t want to add to this perception by adding a plastic sleeve to their cans. They also weren’t a fan of “the particularly garish colours” that plastic sleeves come in. In addition, a number of additional issues were a concern with the plastic sleeves, such as smearing, discoloration, and a noticeable seam where the plastic joins. 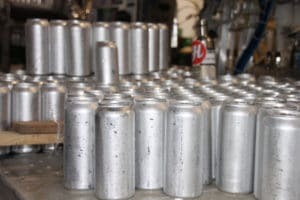 As well, on the filling line the cans are jostling up against each other and can sometimes acquire a dent from the cans banging up against each other. The dent in the can beneath a sleeve is difficult to detect and they often turn into leakers down the supply chain in retail or the consumers home. Sommer agreed, and looks forward to pushing the limits with these labels. “After the first few runs we’ve perfected it for them now, where it has a really nice feel,” Sommer said, noting that the options to further enhance this look and feel are on the forefront. “Labeling has the capacity to handle a lot more embellishments than a sleeve does,” he said. To keep an edge on their competition, Henderson has also leveraged variable content in their marketing. Variable content is a digital printing process that, in a single print run, inserts combinations of names, images and other information in an effort to create something that has more meaning to a buyer. Halmos notes that the brewery has been using variable labels from Lorpon to further a storyline for their monthly ‘Ides’ series, which uses creative recipes to bring Toronto’s history, characters and locations to life. In January 2017, Henderson’s ‘Ides of January’ was showcased at an event in tribute to Ed Mirvish, a Torontonian known for building a landmark retail store and rekindling the city’s theatre scene. At the event, Henderson’s brew team was pouring the ‘Ides’ into cups, and placing the empties on a table behind them. By night’s end, they had all disappeared. “That’s the power of a label,” Halmos remarks. We refer to it as #owntheshelf. “For a brand, that’s huge,” Sommer says. “To get people to keep the product displayed long after it’s been consumed…we know there’s people who still have them sitting around.” For Henderson, it resulted in a huge level of customer engagement and additional advertising, all at no extra cost.